Remove SelectionSaint BarthelemyAnguillaAntigua and BarbudaAntigua BarbudaArubaBahamasBarbadosBelizeBermudaBonaire, Saint Eustatius and SabaBonaire, Sint Eustatius and SabaBritish Virgin IslandsCayman IslandsComorosCosta RicaCuracaoDominicaDominican RepublicEl SalvadorGrenadaGuadeloupeGuatemalaHaitiHondurasJamaicaMartiniqueMontserratNicaraguaPanamaPuerto RicoSaint Kitts And NevisSaint LuciaSaint MartinSaint Martin (France)Saint Vincent and the GrenadinesSint MaartenSint Maarten (Netherlands)St. Vincent GrenadinesTrinidad and TobagoTrinidad TobagoTurks and Caicos IslandsTurks Caicos IslandsU.S. Virgin IslandsVirgin Islands, BritishVirgin Islands, U.S. Ideally located in the prime touristic area of Gustavia, Hotel Christopher Saint Barth promises a relaxing and wonderful visit. The hotel offers a high standard of service and amenities to suit the individual needs of all travelers. Take advantage of the hotel's 24-hour front desk, facilities for disabled guests, luggage storage, valet parking, room service. Guestrooms are designed to provide an optimal level of comfort with welcoming decor and some offering convenient amenities like air conditioning, wake-up service, desk, mini bar, balcony/terrace. Entertain the hotel's recreational facilities, including fitness center, outdoor pool, spa, massage, garden. Discover all Gustavia has to offer by making Hotel Christopher Saint Barth your base. Ideally located in the prime touristic area of Gustavia, Le Guanahani promises a relaxing and wonderful visit. Featuring a complete list of amenities, guests will find their stay at the property a comfortable one. Take advantage of the hotel's pets allowed, restaurant, salon, concierge, business center. Guestrooms are fitted with all the amenities you need for a good night's sleep. In some of the rooms, guests can find bathrobes, toiletries, seating area, balcony/terrace, desk. Enjoy the hotel's recreational facilities, including water sports (non-motorized), spa, outdoor pool, steamroom, children's playground, before retiring to your room for a well-deserved rest. Friendly staff, great facilities and close proximity to all that Gustavia has to offer are three great reasons you should stay at Le Guanahani. Hotel Le Toiny is perfectly located for both business and leisure guests in Gustavia. Offering a variety of facilities and services, the hotel provides all you need for a good night's sleep. Take advantage of the hotel's free Wi-Fi in all rooms, facilities for disabled guests, car park, airport transfer, car hire. Designed for comfort, selected guestrooms offer private pool, whirlpool bathtub, air conditioning, wake-up service, desk to ensure a restful night. Access to the hotel's fitness center, outdoor pool, diving, spa, massage will further enhance your satisfying stay. Friendly staff, great facilities and close proximity to all that Gustavia has to offer are three great reasons you should stay at Hotel Le Toiny. Set in a prime location of Gustavia, Villa Lodge 4 Epices puts everything the city has to offer just outside your doorstep. The property features a wide range of facilities to make your stay a pleasant experience. To be found at the hotel are restaurant, laundry service, shared lounge/TV area. Guestrooms are designed to provide an optimal level of comfort with welcoming decor and some offering convenient amenities like air conditioning, mini bar, balcony/terrace, telephone, fan. The hotel's peaceful atmosphere extends to its recreational facilities which include outdoor pool, garden. 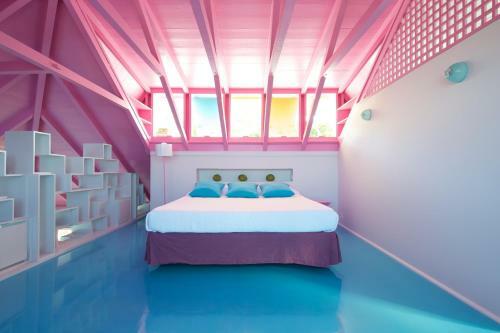 Villa Lodge 4 Epices combines warm hospitality with a lovely ambiance to make your stay in Gustavia unforgettable. Stop at Tropical Hotel to discover the wonders of Gustavia. The property features a wide range of facilities to make your stay a pleasant experience. Free Wi-Fi in all rooms, car park, car hire, laundry service, bar are just some of the facilities on offer. Guestrooms are fitted with all the amenities you need for a good night's sleep. In some of the rooms, guests can find air conditioning, wake-up service, balcony/terrace, telephone, fan. Access to the hotel's outdoor pool, garden will further enhance your satisfying stay. A welcoming atmosphere and excellent service are what you can expect during your stay at Tropical Hotel. Taïwana is a popular choice amongst travelers in Gustavia, whether exploring or just passing through. The hotel has everything you need for a comfortable stay. 24-hour front desk, facilities for disabled guests, luggage storage, valet parking, room service are just some of the facilities on offer. Some of the well-appointed guestrooms feature private pool, air conditioning, wake-up service, desk, mini bar. Entertain the hotel's recreational facilities, including private beach, outdoor pool, massage, garden, water sports (non-motorized). A welcoming atmosphere and excellent service are what you can expect during your stay at Taïwana. 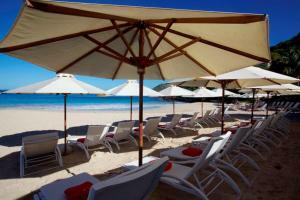 Au Coeur Caraibe St Barth offers accommodation in Marigot. Free private parking is available on site. Every room at this hotel is air conditioned and is equipped with a flat-screen TV and DVD player. Offering an outdoor pool surrounded by a terrace with loungers, Normandie Hotel is located in Quartier de Lorient. Free WiFi access is available. Each room here will provide you with a TV and air conditioning. Located a 5 minutes' walk to the beach in in Saint-Jean, Villa Catherine offers an outdoor pool. This self-catering accommodation features free WiFi. Accommodation will provide you with air conditioning, a balcony and a patio. 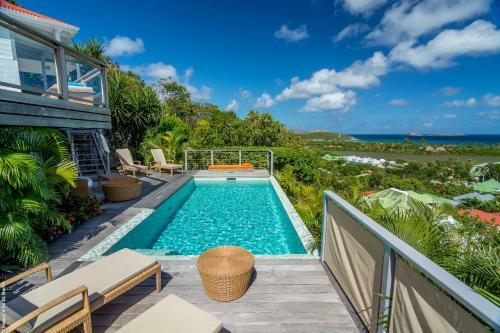 Villa Fleur de Cactus is a property located in a residential area 5 minutes’ drive from the St Barthelemy Airport. Saint Jean Beach is a short 3-minute drive away and Gustavia can be reached in less than 10 minutes by car. Situated on the seafront in Anse des Cayes, Hotel Manapany Cottages & Spa offers an outdoor pool, a spa and tennis courts. The air-conditioned rooms have garden or sea views. 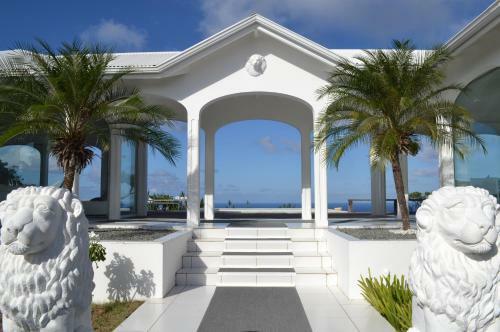 Featuring a terrace with sea views, Villa African Queen is a villa, located in Gustavia. The villa is equipped with air conditioning and free WiFi. Free private parking is available on site. 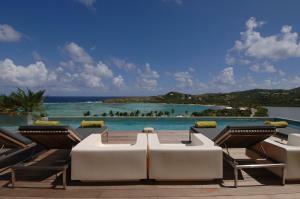 Villas-Apartments Jobyz St Barth is a villa with an outdoor pool, located in Gustavia. The villa is fitted with air conditioning and free WiFi. Free private parking is available on site.